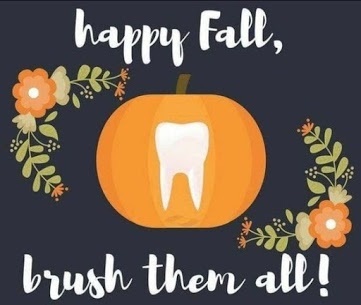 Its autumn time and we want you to “fall” into some good oral health habits! Here are some great tips for brushing up (no pun intended) on your healthy mouth routine. Wow. Not only does that sound healthy, its also sounds amazingly yummy! Excuse me while I go try that! Ok, I’m back. Let me tell you, that was messy, but sooo delicious! You’ve got to try that! We are firm believers and advocate in the benefits of a properly fitted nightguard. Call the office for an appointment to get one today! “Whether they’re lemon, golden or ochre, watching leaves change color in the fall is a pastime many people enjoy. But the same can’t be said for yellowing teeth. To prevent stains and discoloration from foods, beverages or smoking, talk to your dentist about whitening options. From in-office bleaching sessions to over-the-counter whitening products, your dentist will have insight on the best method for your teeth.” It is fast, easy and won’t break the bank. And with the holiday season right around the corner, now is a good time to invest in your smile so you will be ready for all of the coming get -togethers. Give the office a call today to to make your appointment! We hope you enjoy this fun season of the year! ← We Love Our Dentists!